With just three days to go until the release of eagerly-awaited new album King Of Limbs as a download on Saturday, now is the perfect time for a Radiohead retrospective, taking into account every album of their career so far. Rightly regarded as one of the best and most important bands of the past 20 years, no matter how lauded they are, Radiohead’s music always somehow manages to supersede the hype. So, if they’ve always somehow passed you by, or if you just feel like taking one last look backwards before The Future Of Music arrives, read on for the first part of our look at how the previous seven albums shape up. It’s easy to forget that, 18 years ago, Radiohead were just another grunge band, riding the tidal wave of Nirvana’s success (in fact, Thom Yorke was labelled by the press as “the new Kurt Cobain”). 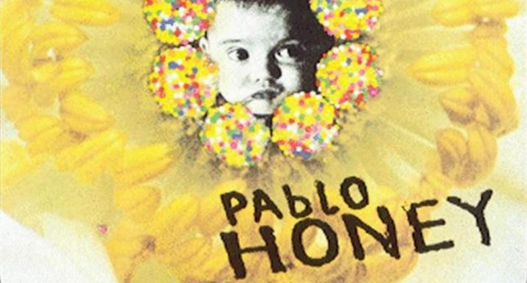 It’s easy to see why - Pablo Honey is stuffed full of scuzzy, heavy rock and teenage angst, drawing upon Sonic Youth and the Pixies with middling-to-good results. Opening track ‘You’ is an early showcase of Yorke’s distinctive voice, and ‘Blow Out’ consists mostly of a wonderful, noisy crescendo - but ‘Stop Whispering’ and ‘Anyone Can Play Guitar’ are fairly forgettable indie anthems. And then of course, there’s ‘Creep’, which threatened to crush Radiohead under its phenomenal success. For years, the band refused to play the song live because audience members would walk out after hearing it, and even wrote ‘My Iron Lung’ about the whole thing. It’s still the best-known Radiohead song out of their entire discography, presumably to the band’s annoyance. Though now overshadowed by the rest of Radiohead’s output, Pablo Honey isn’t a bad album as such. Its biggest flaw is that it is a product of its time - before Radiohead developed their own distinctive sound and were simply following the latest trends - and hasn't dated particularly well. 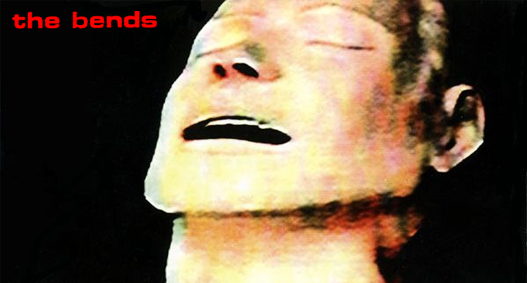 Yet just as many had already written off Radiohead as a one-hit-wonder, The Bends emerged in 1995 with a more refined epic sheen, full of soaring melodies, more crunching guitars and spine-tingling, emotional lyrics. From the twisting bassline of opener ‘Planet Telex’ to the fretboard workout of ‘Just’, The Bends remains the album that sees Radiohead at their most outwardly Brit-rock, making it certainly one of the best starting points for new fans. Whilst it doesn’t hint at the forthcoming experimentalism of future albums, The Bends is simply an outstanding example of its genre rather than posing anything particularly groundbreaking or new instrumentally. The album’s ballads, such as ‘High and Dry’, ‘Fake Plastic Trees’ and ‘Street Spirit (Fade Out)’, are all top class, particularly the latter with its gorgeous finger-picked guitar and haunting melody; however, it’s in the no-nonsense rock epics that The Bends truly excels. ‘The Bends’, ‘Bones’, ‘Just’ and ‘Black Star’ simply sound gigantic, and have rightly become legendary anthems to be bellowed at any drunken opportunity, whilst retaining their artistic and musical credibility. The Bends isn’t the most complex or musically accomplished Radiohead album, but its euphoric Brit-rock refrains ensure it’s one of the most straight-up enjoyable. It was Radiohead’s third album that truly sent them into the stratosphere - and for good reason. 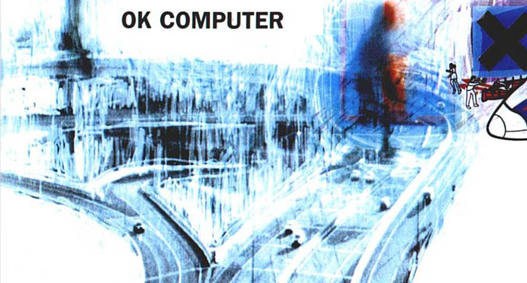 OK Computer was a landmark release, redefining British rock music as the britpop craze collapsed in on itself. It picked up some of the themes of The Bends and ran with them, depicting a hyperdeveloped world of humans living out their lives in sanitised misery. Though Kid A also explores themes of alienation and helplessness, OK Computer is a less personal album - more a cross-section of a world gone mad. In ‘Fitter Happier’ a robotic voice reels off a fractured list of marketing jargon and dark imagery, of “regular exercise at the gym”, “nothing so ridiculously teenage and desperate” and the final, terrifying line “a pig in a cage on antibiotics”. If it all sound a bit grim, well, that’s because it is (Radiohead don’t get their reputation for being depressing for nothing). That said, OK Computer spawned some tremendously successful singles too - ‘Karma Police’ and ‘No Surprises’ can still be heard on the radio. ‘Paranoid Android’ - an epic six-minute track that goes from intricate melodies to an arm-waving slow bit and then back to one of the greatest guitar solos of all time - somehow reached number three in the charts in a victory for challenging rock music over shallow corporate pop. Though Radiohead may have turned at a right angle for OK Computer’s follow-up, plenty of pretenders carried on with its ideas - particularly Muse and Coldplay (the latter of whom once said they owed their “entire career” to Radiohead). It still stands tall as a groundbreaking, immensely powerful record that connected with millions. Happiness is directly proportional to being productive. If you enjoy what you do, you will be more productive.